Tesla has been pushing to build local production capacity in two of its key markets for years and just recently confirmed that it will build its third Gigafactory in Shanghai, China. The new plant-to-be spent some time in the spotlight this week during Tesla’s Q2 2018 investor call. Elon shared some insights into the timeline, production capacity, and cost. Gigafactory 3 is huge because it’s Tesla’s second automotive factory and its first factory outside of the United States. While Gigafactory 2 was inherited from SolarCity and is focused on building Tesla’s solar panels and solar roof tiles, the core of its Shanghai Gigafactory is expected to largely mirror operations at Tesla’s first Gigafactory in Nevada. Tesla is in large part a battery company that sells those batteries in different finished products. Gigafactory 1 in Nevada sits at the core of that strategy, manufacturing its unique 2170 battery cells which are then constructed into the company’s Powerwall and Powerpack stationary storage products and its Model 3 battery packs. Tesla shared in the Q2 2018 investor letter (PDF) that it expected the first cars to roll off Shanghai Gigafactory production lines in 3 years. That’s insanely fast and it’s not clear how much of that timeline is being driven by all of Tesla’s learnings from Gigafactory 1 versus the quicker speed things can move in China. Either way, the timeline makes it clear that Tesla isn’t sitting back waiting for change to come — it’s pushing harder and faster towards the clean energy future it sees just over the horizon. The first cars are expected to roll off of the lines in 3 years. Batteries will be made in Shanghai first and will go into crates of Powerwalls and Powerpacks for Tesla’s customers across Asia. The factory will initially be targeting a production rate of 250,000 vehicles a year from $2 billion of investment. After that, Tesla plans to further increase capacity to a total of 500,000 vehicles per year. The investment required to get to this production rate was not shared, but we did get some financing details. After a question from an analyst about the financing, Tesla broke news that it planned to fund the new Shanghai Gigafactory with local debt from Chinese banks. This move allows Tesla to continue with its expansion without having to go back to the US debt markets or further dilute share price with another capital raise. The $2 billion price tag for Tesla’s freshest planned Gigafactory is slender compared to Gigafactory 1 … and that could be even lower in the end, depending on how much Tesla can optimize the factory before it’s time to lock in the plans and start buying equipment. Its estimated Tesla’s first Gigafactory is a $5 billion investment. 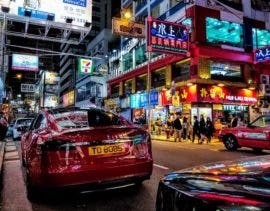 As if Tesla needed another reason to push harder and faster on any of its multiple products or factories, its sales in China took a massive hit last month when the Trump administration enacted stiff tariffs on goods imported to the US from China. In a move straight out of the trade relations 101 book, China responded with a rock solid 40% tariff on select goods imported from the United States. The result: imports into China from most countries face a 15% tariff. Tesla’s imports from the US into China, on the other hand, face an unpalatable 40% tariff. That ultimately translates to higher prices for Tesla’s vehicles for Chinese buyers, which is expected to drive sales down significantly. That’s lost work for the time being, but Tesla expressed its confidence that the company can simply redirect the surplus vehicles to customers in North America and Europe.